Congrats to BananaB98 for the winning entry and 100 duck prize. Thanks to everyone who entered and voted! Here are the final results of the Caption this Drawing caption contest. "Plot Twist: Spongebob actually has a brain"
...AND THIS IS YOUR SPONGEBOB ON DRUGS! This isn't even my final form, PATRICK! "Oh that's not a hat, that's my brain!" A brain!? Boy, squidward wont believe THIS! Look, Patrick! I actually have a brain! Don't worry! It grows back! That feeling when you get a new haircut. What it feels to chew 5 Gum. "Oh it will grow back!" Pink hat?Oh,that's not a hat. That's my brain. "It's not a hat. It's my brain"
It Was His Hat Mr.Krabs! He Was Number One! I cant think of anything. Oh guys, that's not a hat! That's my brain! That's not a hat. That's my brain! hate to break it to ya but this ain't a hat. "Officer, there's a sponge touching his brain"
"this isn't a costume, it's my brain." SpongeBob! Your smart, but at what cost?! *hits blunt* "Bruh the brain named itself"
THE HAUNTED MATTRESS STRIKES BACK! SpongeBob's been playing too much Drawception! Why yes, it IS a pink hat. Any more questions? This scared me out of my mind! pink hat? oh, that's my brain! A Meme addict: Memes, not even once. the frist step of becoming a mushroom. Well... At least he can wear a ghost costume. That's not a hat, it's my brain! That's not pink, that's red patrick. Oh, Aaah! Spongebob admires his Halloween "costume". Who lives in a brain under the sea! That's no hat! that's my brain. The name...it's in here somewhere. Oh nooo! Spongeshroom's brain is showing!!! better hope those zombies arent out tonight! "It must have been because of your pink hat"
Hey, look! I scared him! I have a pink hat, Patrick! It's squishy! This isn't a cap, It's my brain! Frankenbob putting his brain in his head. OH NO!! Spongebob's brains are flying out! Spongebob discovers an odd and thirsty leech. 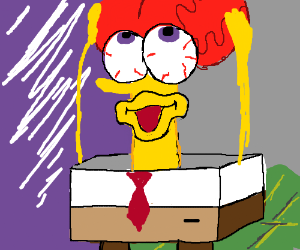 A fusion of Spongebob, Homer, and a clown. Creepy, yellow alien stole Sponge bob's pants. Oh, this is my brains! spongebob, what have you've done this time? Spaghetti-Bob Square-Pants Touches his Brain. A french fry as Spongebob holds their brain. Spongebob Shaved to His BRAIN to Be a Ghost.